Do you work for Allscripts EHR? Learning about Allscripts EHR? We can help. "Good product with limited opportunities for development and limited future"
The product is good for what the current needs are and is reliable. Good options to export data. Good pre-made reports as long as you understand the limitations of the reports. very user friendly and intuitive. Allows for easy export to excel and text files. Variations of different reports that can be by Date of Service of posting data. This has been very valuable to me. The customer service is bad and the reps are not knowledgeable. Inquires get unanswered for a long time and the answer has been that they are not a data company and can't help us. Very risky to invest in a product lie this because the company is not moving in the right direction and may loose is competitive advantage as it has expertise in medical billing bit not in database design and certainly not in servicing customers. Many known errors in reports are not addressed. Make sure you understand the limitations of reporting and customer service and be prepared to switch to another product long term. Midterm this might be OK but not for more than 5 years from now. We contacted them to inform them of few serious flows in their report design and the options to calculate work and total rvus and also some other smaller issues and they told us they will not address our concern because they are "not a data company". Access to billing data; export and analysis of data. I make dashboards for about 84 providers and 14 divisions. Home screen with problem list, meds, notes all available. I like the recent upgrade where there is a list of recent common orders, based on both my behaviors and that of our practice. Multiple clicks to complete tasks or get to a point where you need to go. I don't like how there is not a way to assign my inbox to a particular user when away. I don't like how emails simply disappear after sending, if I don't first save to chart prior to sending. Clunky to use, a lot of clicks to get to where you need to go. Cheaper than Epic, which I used in residency, but I miss the increased functionality of Epic. Though this made Epic more daunting to learn, once I did get used to Epic, I found it more conducive to my needs, e.g. smart lists and smart phrases were easier to create. Also free texting is much more cumbersome, as you are typically forced to click on various drop down boxes for review of systems and exam/vitals, which I hate. Just more clicks and more things I have to select, or at the least deselect things. There are ways to customize exams and ROS but this also is cumbersome and not very straightforward. Ability to document notes and billing levels, and then helps office manager bill. This is a seamless process requiring less paperwork, and leaves an electronic trail when reviewing a patient's chart. 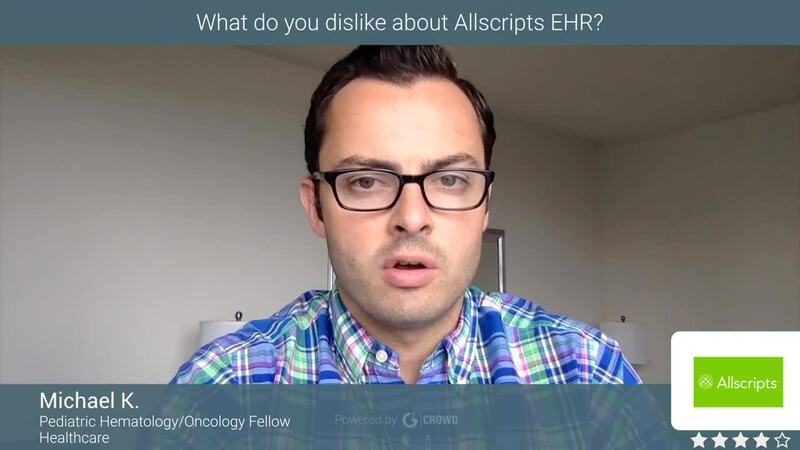 "Allscripts EHR is outdated and not user-friendly!" I like being able to view the labs, notes, and records all in one application. It's a convenient tool in theory for this purpose...however, most of the time, Allscripts crashes because it is so old and becomes overwhelmed by multiple tabs being opened. Lastly, Allscripts EHR crashes MULTIPLE times a day...this is truly just unacceptable. I would advise NOT to use this painfully awful system. Use Epic instead! Epic centralizes all aspects of the EHR so you are not scrambling for records from other departments or physician offices. I have not solved any business problems with Allscripts EHR and there are absolutely no benefits to using this archaic system. Software was very easy to use and I liked the user interface which makes it so easy for new user to get familier with the software and solve the complex cases in less time. License cost is moderate and this is what makes one of the plus points for it. I would recommend it to everyone where time and money is important. More need of tooltips and detailed documentation along with quick customer support. Product documentation is not detailed and this increases the dependency on the customer support. If the documentation is improved this will be the great product to use. If you want to reduce time for processing and reduce cost of licensing then go for it. If you want to reduce time for processing and reduce cost of licensing then go for it. If you want to reduce time for processing and reduce cost of licensing then go for it. If you want to reduce time for processing and reduce cost of licensing then go for it. If you want to reduce time for processing and reduce cost of licensing then go for it. We had training issue for new users. It used to take lot of time but this software helped to reduce the training time and hence processing time also reduced. This was one big plus for us. We had training issue for new users. It used to take lot of time but this software helped to reduce the training time and hence processing time also reduced. This was one big plus for us. We had training issue for new users. It used to take lot of time but this software helped to reduce the training time and hence processing time also reduced. This was one big plus for us. We had training issue for new users. It used to take lot of time but this software helped to reduce the training time and hence processing time also reduced. This was one big plus for us. We had training issue for new users. It used to take lot of time but this software helped to reduce the training time and hence processing time also reduced. This was one big plus for us. I especially like the acronym expansion feature in this EHR. It saves such a valuable time and effort to type notes because of it. I dislike how the program can sometimes be slow and unexpectedly close on me. If you are using paper notes, I would recommend that you don't hesitate one moment and adopt Allscripts for your needs. Allscripts is especially beneficial for keeping all the health records accessible from anywhere in the hospital. The convenience of accessing all the health records for any patient is really convenient. "Certified EHR with easy integration with different labs." Organization is intuitive and there is a lot of functionality to run reports. It is relatively reliable in that it does what it's supposed to do.I appreciate that I can open past notes in separate windows, so if I want to reference them I'm able to do so without having to lose all of my other open windows.The ability to mark results that have already been seen is very useful and utilizes an interface that no other EMR has been able to perfect. It takes forever to load even after doing something as simple as changing the time of an appointment, or worse, thinking about changing the time of an appointment but dragging it back into its original location.I dislike the integration with other systems, specifically with FollowMyHealth notes from patients.The interface is not as aesthetically pleasing as some other EMRs are. When creating your own patient lists, there are limitations on how to organize the list locations. Great tool but comes up with a hefty price.After sales support is good too. Yes, it was a nice platform that is integrable to other hospital systems.Make sure you get a good team of analysts and consultants for roll out.Ensure whether or not integration with existing platforms is possible. "All Scripts is outdated and not user-friendly!" I like being able to view the patient chart, labs, and notes all in one app. The interface is extremely outdated and the system is not forgiving if you make an error while putting in labs, for example. It is not user-friendly, which is unfortunate given the complexity of working in clinical trials and research. Update the interface so it does not look like it's from 1995. Additionally, make it easier to back track and correct a mistake while inputting an order. There are no business problems to be solved with Allscripts EHR. Unlike Epic EHR, this system does not sync across the hospital system so you cannot view a physician's note from another department. There are no benefits to this system. "Affordable to small and midsized hospitals.very simple understand." Connection with other departments is not well catered for thus not well integrated.inconviniencies may occur due to it's break downs some times.its not very fast in operation as you may want it to be but it's owesome to use. "All scripts making life easier"
I use All scripts to gain access to physician office charts in order to provide Case Management to patients at home. I am able to see office visit notes, consults, medication lists etc. It is very busy to look at. Once I select a document to view, it opens in another window and is easy to read. But the list of occursnces is congested and I really have to look to find what I am looking for. It is a good platform for physician notes and manages items that need attention, including preventative health screenings that are due. I work for several Phrygian practices and All Scripts allows me to manage many patients from all practices from a remote location. I used to have to call the office to request they fax me the information I needed. "E-fax available.very easy to use and a friend to operator,making it suitable to small facilities"
Has e-fax feature.learning about it is encouraging due to its simplicity.it's huge features make it suitable in a hospital facility which require efficiency on top.Allscript ehr layout is simplest and the best in an hospital. I hate how technical support team is slow with the software crushing sometimes.technical support team need to be improved to reach the standads of the software allscript ehr. You have a small to midsize hospital requiring quality affordable service,then employ Allscript ehr which is easy to operate,user friend,simple to learn about and cheap to afford.No clicks no regrets. it has raised hospital standard in a number of ways due to e-fax feature and being versatile and customizable.has increased our clients due to it quality outcome.hospital income is raised and there are minimal cmplains of clients now.Allscript ehr is awesome. "Allscripts is all that and a bag of scripts"
I have been using Allscripts for 5 years now and I love it. The software is very user friendly. With all software you will need a little bit of training. Once you start using it, it is very easy to navigate. There is not much I don't like from Allscripts. I wish they had bigger icons to view the different sections. The business problems that Im solving with Allscripts are reducing the risk of medical errors. The doctors get all the information that they need to assess the patients needs and symptoms. "Allscript ehr being versatile and well customizable makes it great for use in small facilities "
"Allscript ehr is customizable and waste less paper"
Works nicely with minimal errors and is easy to understand and customize,it also wastes less paper thus recommendable for use due to economical purposes. Organization is intuitive and there is a lot of functionality to run reports. It is relatively reliable in that it does what it's supposed to do, albeit slowly. It's very slow even to do basic tasks, the aesthetic is reminiscent of AOL 2003. It takes forever to load even after doing something as simple as changing the time of an appointment, or worse, thinking about changing the time of an appointment but dragging it back into its original location. It functions as an electronic medical record and works well in that regard. I'm unaware of any problems resulting in our use of Allscripts/ netsmart or problems that were solved by the same. "Easy to use and efficietn"
Using all scripts has made it easier than ever to obtain vital health records on patients. I dislike the lack of organization between the various screens. EHR is amazing, it will make your life much easier. I am now able to pull medical records from any office in the same health systems which Improves patient visits and their quality of care. "Basic and functional with some nice additional features"
Allscripts is really easy from a provider's perspective because it allows me to reference the patient's chart and past notes all in one place, with minimal clicking back and forth. I appreciate that I can open past notes in separate windows, so if I want to reference them I'm able to do so without having to lose all of my other open windows. I also very much appreciate that the e-prescribing mechanism shows me clearly whether the prescription has been transmitted in real time. I dislike the integration with other systems, specifically with FollowMyHealth notes from patients. There is often a lag time between when I get notification of the patient's message and when they sent it, so that by the time I see it they have already called with the same issue to follow up about an answer. Also, there is limited ability to customize as a user in a large practice group. The practice group decides on the note templates, and there is no way as an individual to personalize the note. Allscripts can't do everything, but it does a decent job of integrating information from multiple sources. It's also really easy to use once you get used to it. Allscripts EHR lets me keep medical records on my patients, e-prescribe, and also collaborate with my colleagues through internal messaging. It allows me to coordinate care without having to wait for a call back or wait on hold while trying to talk to other busy providers. "Simple to use and user reliable"
We'll customized especially when used by clinicians.it has helped clinical communication enabling customization..it's very easy to use and versatile.do you need huge profit in an hospital with super service,if yes employ allscripts ehr very suited in an hospital facility. It's not well integrated and it is slow in operation creating crowds in hospital departments especially in cliniacian offices. It's layout is simple and it suits both small and midsize hospitals since it is not expensive to install. It has increased number of clients giving room for more profit and work flow is owesome since allscripts is user friendly and easy to use and learn on use.it has enabled team work due to it's easeness of learning operation and using. "Versatile and customisable with an e-fax very characterised for a health facility "
The layout is owesome and very simple. It is a friend to user and very easy to click on usage. The e-fax makes the software owesome in hospital departments. Navigation is not easy Which make it slow to install in a busy hospital .software management is not reliable. The very best for small hospitals and mid size hospital due to low cost. Learning it's use is simple making it the best to install.it is efficient with simple layout. "Allscripts is a good EMR but has much to improve on"
The ability to mark results that have already been seen is very useful and utilizes an interface that no other EMR has been able to perfect. Allscripts has a long way to go to become a system like Epic. It is not customizable for each user, and because of this lack of flexibility, it is sometimes hard to use. The interface is not as aesthetically pleasing as some other EMRs are. When creating your own patient lists, there are limitations on how to organize the list locations. The EMR gets the job done at a basic and simple level and delivers what it promises. It is a huge improvement from the paper chart days and is definitely easier to use than most of the EMRs on the market. Allscripts allows office staff to organize our medical documents by type, which is very helpful (i.e. I can find pathology reports, consultations, etc quickly). I also like that there is an integrated PACS viewer, so I can review my patient's films without having to log into PACS. My biggest gripe with Allscripts is the way it displays labs - the scanned papers are essentially thrown together in no meaningful way, and there is no way to trend values. Fixing this would be very helpful. Also, allowing us to sort the patient's notes by the author's service (i.e. PMD, surgeon, etc) would be helpful. Allscripts has allowed our large health system to start keeping more integrated records across different service lines. "The software is owesome in terms of layout and easeness of use.its customisable"
"Needs to be more streamlined"
Allscripts functions great on a very basic level. I like that you can easily look at past medical history, notes from physicians and therapists all in one program. Allscripts needs to be more streamlined (i.e should be able to easily move from schedule, to billing and documenting). me, the program desktop seems very cluttered. I like that you can easily look at past medical history, notes from physicians and therapists all in one program. So before an initial evaluation for PT, I can review old doctor notes and view imaging. I really like the organization of Allscripts and the layout of the file. Lab values, vitals, and notes are all easy to find in Allscripts because the layout makes sense. I dislike that it is difficult to search for and place an order if you don't know the precise title. Most EHR systems have a way of searching for a partial title, but Allscripts' search method is too difficult and cumbersome to use. I also dislike that the allergies are in small font and do not really draw your eye the way they do on Epic. It is easy to chart in Allscripts, saving time spent on charting and allowing more time with patients. "Do your research when choosing a EMR"
A nice EMR, can be customized to your physician and practice needs. Do your homework. Compare many before deciding. Ask other colleagues what they use, their likes/dislikes. We are efficiently charting patient information, meeting requirements and measures, using state of the art software to document patient histories. Pretty much everything since the new update in October. The program crashes too often. I enjoy the functionality and ease of this software. The help section is so informative as well as Client Connect. When merging patient accounts everything does not merge. Give it a try. I like that fact that we also have Phreesia which is very compatible with Allscripts and we also have the EHR. "Allscripts gets the job done"
The best part about Allscripts is that it connects me to thousands of physicians, hospitals, and in home services all under one roof. The tools utilized address most aspects of the health industry. I believe Allscripts could connect to even more healthcare systems in the future. Rely on their customer service to help with any questions you may have. They are a great team to work with and have many abilities when it comes to knowing their system. Allscript is financially managing our health population, in addition to precision medicine solutions help connect our company and services to the community. Therefore, Allscript is helping to connect us to the community in ways we were never able to before. I feel that Allscripts is very user friendly and I love that it has an audit trail unlike some of its competitors. I feel that some aspects of Allscripts are out dated and could benefit from some improvements. I have used Allscripts in the past for management of electronic medical records. "Using Allscripts as a provider and as a RN for over 10 years"
User friendly interface. Easy reporting. Easy logistics and error interface. Benefits include easy access to patient records and ability to treat quickly amd conveniently. We do have an issue woth quick turn arounds times on reported problems and lack of knowledge from support staff. "user friendly but very in depth"
I really liked how once you got the hang of it it was user friendly but there are so many intricate things about it that it does take time. I used this at a previous job and the training for this took a week, unlike some other programs where you could learn them in a day. "Not as user friendly as it could be"
Easy to use schedule. You can use different colors to help identify a room. This is not a user friendly program. It takes a while to learn it. The drop down menus are not well organized and when new things are added they are just given an extra word instead of replacing the current ones. It causes a lot of clutter. A medical charting program. Using the program for electronic medical records. "Used AllScripts for Hospital Based CaseManagement Reviews"
Our institution is using Allscripts Patient Flow Manager. The most important thing that really helps us is that it allows us to have transparency in the bed situation in our hospital. It allows us to plan ahead of time in terms of allocating staff and resources and what is the expectation in terms of bed situation in our unit. The interface is quite slow to load, and sometimes there is a lag in the information presented on the dashboard. Also, the interface is quite challenging for first-time users. Yes, it was a nice platform that is integrable to other hospital systems. "Work in ambulatory setting using AS Touchworks EHR "
Limited customization, not user friendly enough. It crashes all the time and has lots of issues linking with the printer sometimes. We use allscripts to compile medical records for patients. "Basic EMR for basic needs "
Allscripts is very easy to use in the sense that it's logical and it's very aesthetically pleasing. The format is large so it's easier for people that are far sighted. Works well with other software. Not customizable, limited use and ability to capture all services rendered. This is a good affordable solution to a rural hospital that doesn't see complicated cases and you can customize for EMTALA cases. Chart capture, services rendered, accurate patient recording.